We are sorry to hear that you may be ready for a knee replacement. The good news is that there have been great advancements in total knee replacement surgery. It may well be the fastest growing surgery done in North America as the Baby Boomer generation ages. 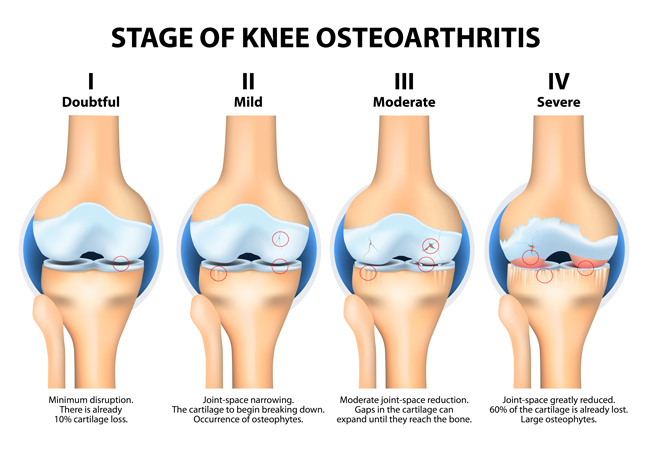 In the diagram above, you will see what a normal knee looks like and the stages of change that can happen over time with wear and tear. It is normal for us to develop arthritis over time. Hopefully, this does not happen until much later in our lives. When it does happen, we can feel pain, stiffness and less movement in our knees. Stairs can become quite difficult. Getting up and down from sitting can become painful. Walking can be difficult to impossible in the later stages of OA. In the early to later stages of OA, physiotherapy may be helpful. Interferential current and ultrasound can reduce pain. Hands on physiotherapy mobilizations and exercise can also help to reduce pain from OA of the knee. Walking with a cane in the opposite hand can help to unload the sore knee. You may also be able to reduce pain by getting a cortisone injection or a synovial fluid replacement injection. An orthopaedic surgeon normally injects these. There is a limit to how many of these injections can be done on your knee. Your surgeon will guide you in this regard. Another very good option to delay Total Knee Replacement Surgery is to get a Custom Knee Brace made for you to unload your OA knee. This can be a great way to delay surgery and continue to function with less pain. A Custom Knee Brace works best if one side of your knee has more pain than the other. 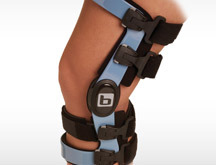 The brace can then shift the pressure away from the painful side of your knee. If you are interested in seeing if this could help you, please contact our office at 905-277-1782 and ask about a Custom Knee Brace. How do you know when you are ready to have Total Knee Replacement Surgery? At some point, your surgeon will advise that you need total knee replacement surgery for your knee. This is a difficult decision to make. Most people decide that they want to get Total Knee Replacement Surgery when they can no longer stand the pain. The pain interferes with your life so much that you just can’t stand it anymore. You will know when you reach this point. There is a waiting period to get into the surgeon and get onto the surgical list. It is a good idea to get into a surgeon for a consult well before you decide that you are ready for surgery. That way, you will already be in the queue and the wait time should be lessened. It is a very good idea to meet with your physiotherapist before your Total Knee Replacement surgery. They can guide you through the process that you will follow after the surgery. They can prepare you for the exercises that you will be doing immediately after surgery. They can also answer any questions that you have before the procedure. What are the goals of Total Knee Replacement Surgery? The main goal of Total Knee Replacement Surgery is to stop the bones of your leg from rubbing against each other. This will stop the pain. When the old arthritic bones are replaced with an artificial knee, it gives your knee a new smooth surface that can move without pain. It is important to start physiotherapy treatment immediately after total knee replacement surgery. While you are in hospital, typically the hospital physiotherapist will visit and start exercises with you. The doctor will have prescribed pain medication for you. It is wise to take enough medication so that you can begin stretching your knee right after surgery. There is going to be pain. Take the pain medication so that the pain does not get ahead of you. Get stretching right away. Follow the advice of your physiotherapist closely. The hospital or the doctor should also give you instructions on exercises to continue with after leaving the hospital. In home physiotherapy may be arranged for a few weeks after surgery since it is often difficult to get out to a clinic at first. Once again, take enough pain medication so that you can do the exercises that the physiotherapist and your doctor have recommended. Early stretching is the best way to get a good outcome after the surgery. The longer you wait to do the stretches, the harder it gets. Your body starts to develop scar tissue in the joint if it is not stretched well early. The scar tissue develops very quickly after surgery. I cannot stress enough the importance of stretching as far as you can into bending and straightening the knee. You will need about 110 degrees of bending to get up and down from sitting and go up stairs. You will need a fully straight knee to walk properly. A knee that heals in a bent position means that you will need a cane or sometimes a walker to prevent falling. That is a poor outcome and you want to avoid it at all costs! Stretch, stretch, stretch every day, several times per day. Work with a physiotherapist that is trained to work with post-op total knee replacement patients. They can guide you with different exercises that will help if you are getting stuck. You will need help from a trained physiotherapist to get full movement. You have 12 weeks from the day of surgery to get full movement. After that, the scar tissue is too strong and you are stuck with the movement that you have. Do not wait to start physiotherapy. 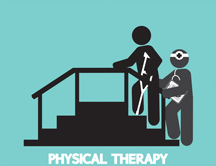 Formal physiotherapy treatment in a proper clinic, three times per week is advised within two weeks of surgery. Your physiotherapist may use interferential Current or (IFC) to help reduce swelling and pain. This will make it easier for you to move your knee. A knee slider board is another great tool! These provide a comfortable way to get your movement back quickly. At PhysioNow, we have knee slider boards available for rent for a nominal fee. If you are thinking about having Total Knee Replacement Surgery or are already scheduled, please give us a call at PhysioNow (https://www.physionow.ca/services/physiotherapy/). One of our highly trained physiotherapists will be happy to meet with you and guide you through the process. If you are interested in a Custom Knee Brace, please Call us at . PhysioNow has 4 convenient locations to serve you in Mississauga & Etobicoke. When is the right time to undergo a knee replacement? It is time to do a knee replacement when conservative Physiotherapy treatment has not allowed you to regain your normal function. I would suggest that you try a Custom unloader knee brace first before doing a knee replacement as this can ‘buy you a few extra years of comfort’. When you have done all of these things and you still cannot walk comfortably, it is time to do the surgery. Wait as long as you can but dont allow it to significantly affect your ability to get on with your life. Is there any way to avoid surgery for knee pains? Yes, go for Physiotherapy treatment and ask if you are a candidate for an unloader knee brace. What is the recovery timeline after a knee replacement? Most people take at least 6 months to recover most of their movement and function after a knee replacement. Ongoing recovery can take up to a year after surgery. A skilled Physiotherapist can help to reduce the time needed for recovery. You must make sure to do your exercises early after surgery and frequently! How much pain should I expect after my knee replacement surgery? There is definitely pain after this surgery. Your surgeon will provide strong pain medication to help with this. Over time, the pain will fade and things will get easier. Movement of your knee will initially hurt, but in the end will help to reduce your pain. Make sure that you continue to see a skilled Physiotherapist after your surgery for at least 3 months or until you have recovered full movement. They will help you with pain control strategies! Do not wait to work on your movement! Your knee will stiffen up quickly! How long is my artifical knee replacement expected to last? This depends on each patient and a variety of factors. It depends on your weight, your activity level, health and strength. The more stress you put on the knee, the less time the knee will last. That being said, there is an optimal amount of activity for a knee to work best and smoothly. In general, knee replacements can last about 15 years. You may only have 2 replacements on each knee in a lifetime. This is whey surgeons will hold off giving you a new knee as long as possible.